SCARS was an "In House" training program. 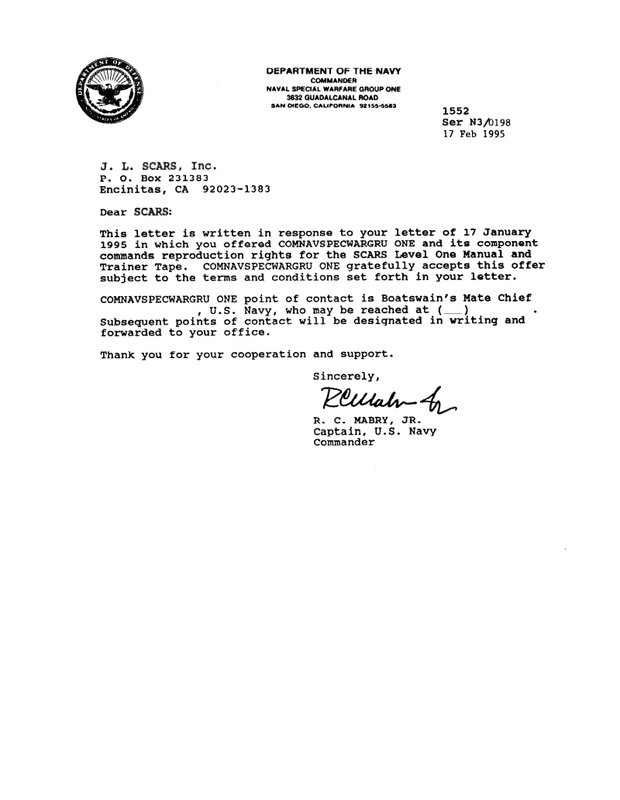 In 1988 Jerry Peterson’s credibility received the attention of the United States Navy Special Warfare Command at Coronado, CA (US Navy SEAL headquarters). The Special Warfare Department of the Navy began contracting Jerry Peterson and his corporation to develop a program, later titled "the SCARS project," that would universally apply both physiological and physical fields of CQB (Close Quarters Battle). Between November 1988 and February 1989 Jerry Peterson and the US Navy began testing the SCARS project using combat veterans within the SEAL ranks. The Navy was restricted to combat veterans that had either real world hand-to-hand combat and/or advanced training in any form of fighting art (martial arts). SCARS is 100% effective in all CQB actions. After three months of physical testing the Navy agreed that SCARS had proven, beyond a shadow of a doubt, not to stem from a style of martial arts. This system could possibly be the standard for hand-to-weapons combat for the US Navy Special Warfare Command Department (SEALS). 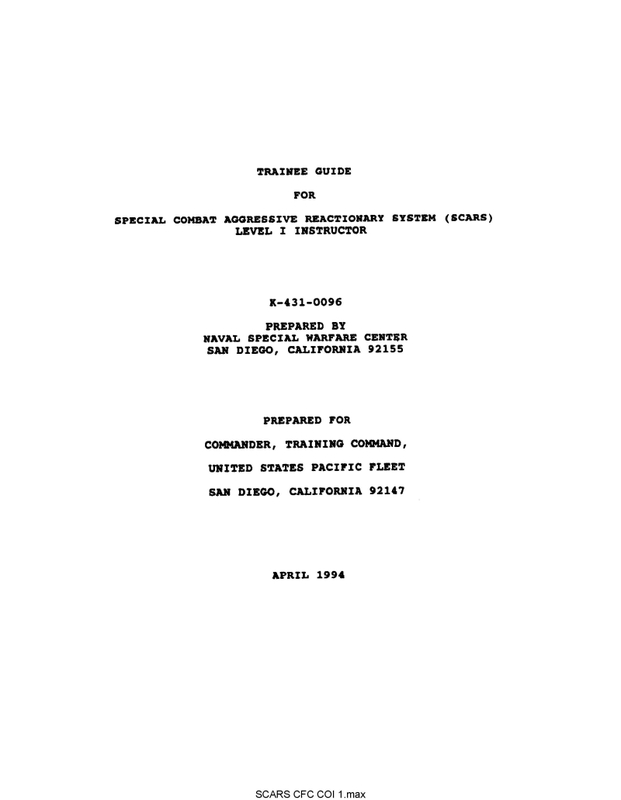 In March 1989 the Navy and Jerry Peterson agreed that further development and testing was warranted. The Navy agreed not to divulge any information on the SCARS project to the public. Jerry Peterson also agreed not to release any mission specific information about the training and SCARS. Should SCARS be given official sanction and approval by NETC, (Command for Navy Educational Training) limited statements could then be released. 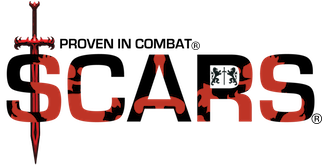 Being classified information allowed SCARS to be tested in every condition of international combat and/or police action that arose where the military may be used. Around April of 1989 the Department of the Navy officially contracted Mr. Peterson and his corporation to begin further development of the SCARS program. Develop and implement a platoon combat course for qualifying platoon deployment. Develop and implement combat ready course for Special Boat Units. Develop and implement a Force Multiplier program to certify U.S. Navy SEALs as subject matter experts in the field of Hand-to-weapon combat, both in non-lethal and lethal use of force. From 1989 to 1994 Jerry Peterson personally headed up the development and training of the SCARS programs. After 5-1/2 years of development and testing of SCARS by the Special Warfare Command, the US NAVY SEALs received official approval from the Navy Department of Education CNET. This was the first time in the history of the US Navy that a hand-to-weapons system had officially been approved as a standard of combat. To date, Jerry Peterson is the only individual ever to have established a proven set of principles based in modern sciences. After official approval of all of the SCARS programs Mr. Peterson licensed the Navy to conduct the SCARS Force Multiplier Train the Trainer Program. This was a Level-2 300-hour SCARS "Train the Trainer" course, it was developed and instructed by Jerry Peterson. This final course was the procurement of Jerry Peterson's work for USNAVSPECWARCOM. 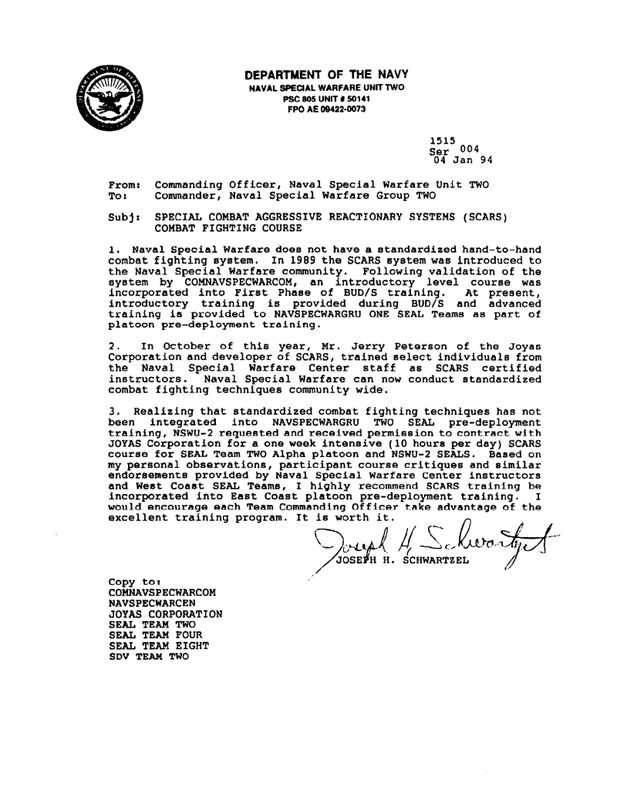 Shortly after the SCARS/CFC (Combat Fighting Course) was officially implemented the US Navy West-coast command requested a SCARS military demonstration. The SCARS program was presented to The United States Secretary Of State, the Commanding Four Star General of the US Army, the Secretary of the Navy and other political personnel whom all gave their overwhelming approval of the program. This program taught by Level 2 SCARS Instructors was a "closed" course, meaning there was only a certain allotment of trainees that could request a slot to go through the program. The SCARS train the trainer program produced over 300 SCARS subject matter experts in the field of non-lethal to lethal hand-to-weapons action. Thousands of US military personnel have gone through the SCARS programs. During this time, 1 in 10 Navy SEALs was a subject matter expert in SCARS and qualified to train other SEALs. After the Force Multiplier program was completed the Instructor program was finalized. Today SCARS principles and the Offensive Mindset™ are still taught and utilized within the Special Forces Community. No military SCARS instructor is allowed to teach the SCARS programs outside of the military. To this date Mr. Peterson has restricted all licenses to certify subject matter experts in the SCARS system of sciences solely to the US Special Operation Community. “… I consider a large part of the future of Naval Special Warfare greatly depends on the SCARS/CFC System. Special Operations personnel are anytime, anyplace soldiers with a very difficult mission…. We cannot afford indecision or lack of confidence at a critical time. However, the SCARS/CFC System greatly enhances the skills of a soldier, mentally and physically, thereby greatly increasing mission success.” F. B. , Op Chief SEAL Team THREE.